Heat grill. In medium bowl, combine ground beef and 1 teaspoon of the lemon-pepper seasoning; mix well. Shape mixture into 4 patties, 1/2 inch thick. In medium bowl, combine mushrooms, remaining 1/2 teaspoon lemon-pepper seasoning and vinaigrette; toss to coat. Set aside. When ready to grill, place patties on gas grill over medium heat or on charcoal grill 4 to 6 inches from medium coals. Cook 11 to 13 minutes or until patties are thoroughly cooked, turning once. To toast rolls, place cut sides down on grill during last 1 to 2 minutes of cooking time. 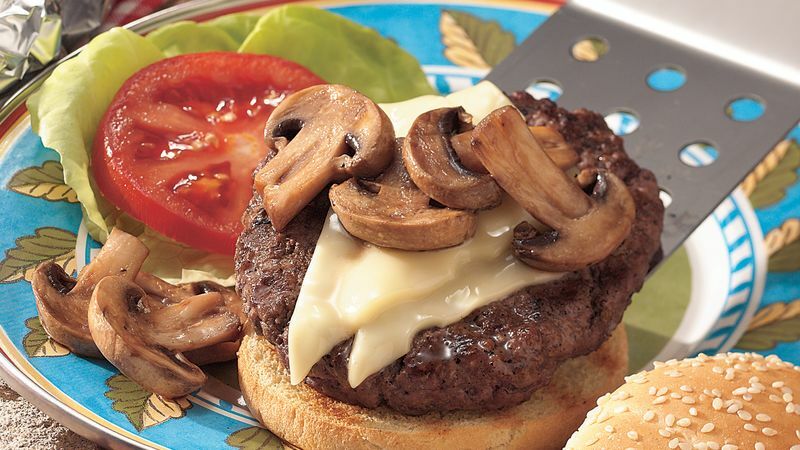 Place 1 slice of cheese on each patty; cook an additional minute or until cheese is melted. Place patties on bottom halves of rolls. Top each with mushroom mixture and top half of roll. To broil patties, place on broiler pan; broil 4 to 6 inches from heat using times above as a guide, turning once. To toast rolls, place cut sides up on broiler pan during last 1 to 2 minutes of cooking time. Place 1 slice of cheese on each patty; cook an additional minute.